Tokyo has earned a reputation as one of the world's top dining destinations, thanks to its traditional cuisine, modern Japanese fare, and international flavors. The city's restaurants have more Michelin stars than Paris and New York combined, yet amazing meals can be found at street stalls and hole-in-the-wall joints too. Here are a few dishes and activities you won’t want to miss. Local Tokyo specialties, often called Edo-mae, have become so globally popular that they're often synonymous with standard Japanese cuisine as a whole. Soba noodles, made from buckwheat, gained popularity during the Edo period and are now eaten across Japan, while nigiri, a popular type of sushi, started as a fast food dish in Tokyo before blasting into worldwide popularity. A savory pancake made of chopped seafood, cabbage and a flour-and-water batter, monjayaki has also made its mark—there’s even a street nicknamed after the dish in Tsukishima. Hot pots are popular in Tokyo too, with varieties including sukiyaki, shabu-shabu and chankonabe, a chicken-and-vegetable hot pot originally cooked for sumo wrestlers. One of Tokyo's most popular wagashi, or traditional sweets is a small, waffle-like cake filled with sweet red bean paste. Sit down next to a local salaryman after a long day of work for a drink and bar fare at a local izakaya bar. Eat your fill of yakitori skewers in the city's famed Yakitori Alley. Take in the Tsukiji Fish Market's rowdy tuna auctions and diverse offerings on a guided tour that can be combined with a sushi-making class, where you'll learn how to prepare nigiri from a master chef. 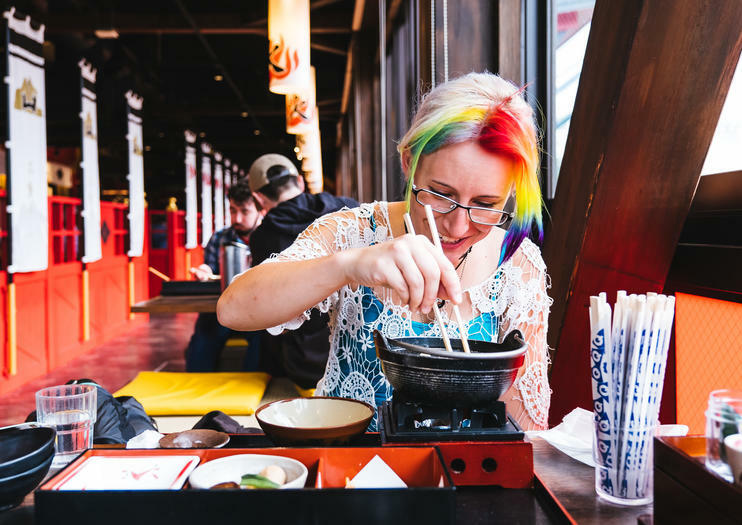 Taste a variety of Tokyo's iconic dishes on a food walking tour that hops from street food vendor to traditional izakaya bar to restaurant. Sample some green tea or sake on a guided tasting. Enjoy the perfect sushi-lover’s experience during this 4.5-hour visit to the world-famous Tsukiji Fish Market, followed by a sushi-making class led by master instructor and lunch. Get lost in the labyrinth of seafood stalls with your guide at the world’s largest seafood market, then head to your cooking workshop, where you’ll learn to make sushi favorites including rolls and nigiri alongside your class of Tokyo locals. Your combined Tsukiji and sushi-making class also includes subway transport to the market. Explore the izakaya bars of the Ueno, Shinbashi or Ikebukuro districts of Tokyo with an expert local guide. Your 2-hour tour takes you into popular local spots that most visitors never see. Delve into the heart of Japan’s izakaya — a casual bar that serves up small plates of delicious Japanese fare (think tapas). Your guide translates the menus and helps you to choose a range of tasty food and drinks at three different venues. Don’t miss this chance to experience local culture and food traditions firsthand.